Drag within the image to explore the Labbamolaga church ruins environment in virtual reality. 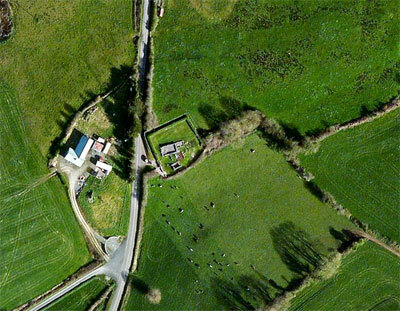 A mere 78 m (85 yds) separate this crumbling stone oratory on Lismalanny Hill from an alignment of four standing stones in the field below known as Parc a Liagain, “Swardy (grassy) Field of the Pillar Stones.” These pillars may once have been part of a circle of as many as eight such stones. 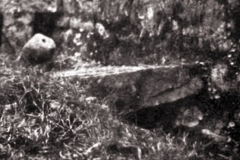 Curiously, this stone alignment was also known locally as “Leabba Molaga.” 6 Some have suggested that the missing stones may be seen today in the “almost megalithic” entranceway to the Labbamolaga Oratory.7 The church and megalith proximity, considered along with the adjacent holy well and the Bronze Age burial urns discovered nearby, suggests that the site has maintained a spiritual significance for the locality for more than 4,000 years. 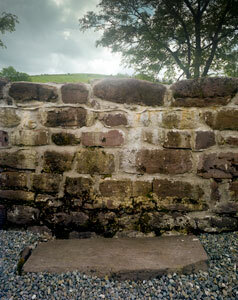 Click to see the “Saint’s Bed” stone in high resolution. 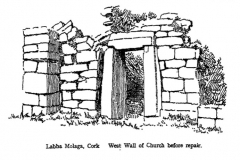 The Labbamolaga Oratory was not built as a church meant for regular worship. 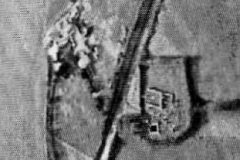 Rather it was constructed as a monumental grave at some point after the death of the monastery’s founder, a date not recorded in any ecclesiastic history. 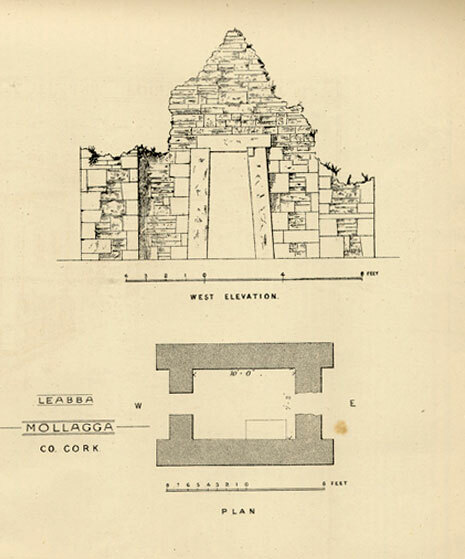 The structure has been described as “much ruined and much restored.”8 The formerly crumbling walls of the oratory may be seen in a sketch in the gallery below. 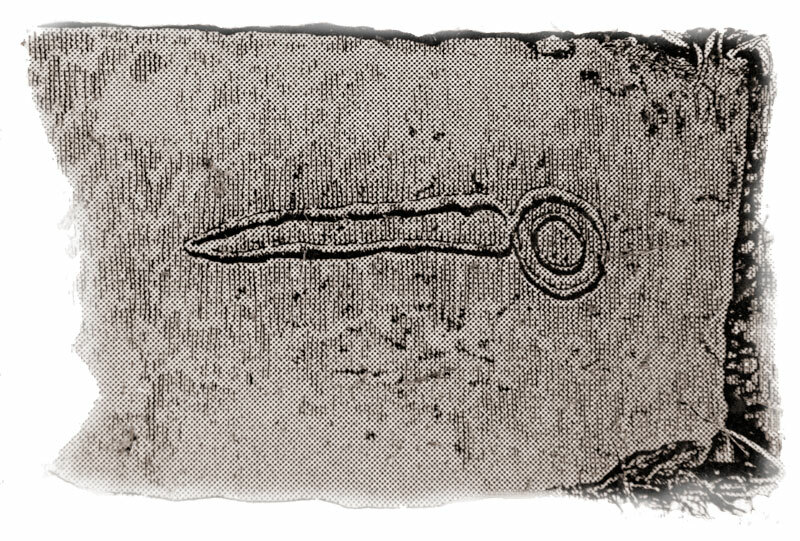 The mortal remains of the saint are said to rest under a horizontal slab set against one wall of the oratory, a slab on which a faintly visible volute carving suggests that someone of significance lies beneath.9 The slab, and its volute carving, may be explored in the virtual-reality tour. The stone alignment was reduced, before 1852, to the four pillars seen today. 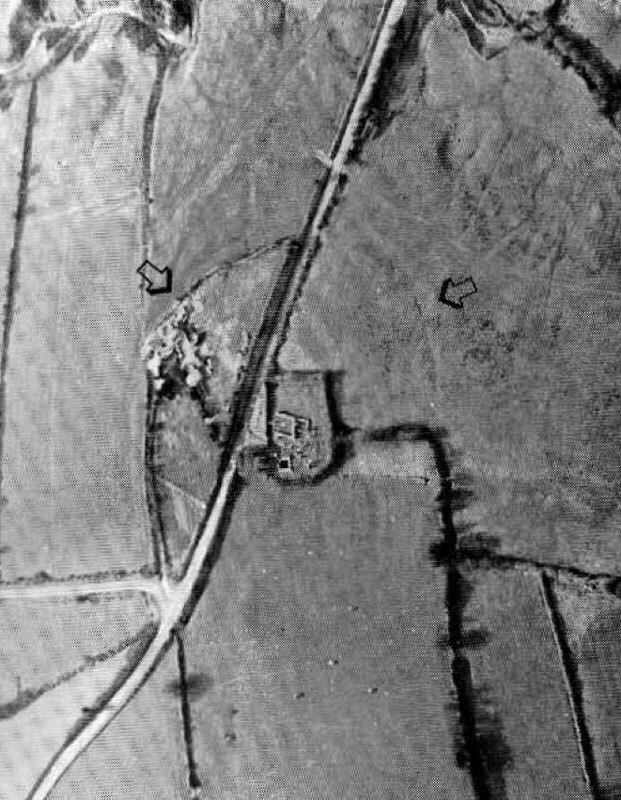 John Windele recounted how he was informed by the peasantry that there were formerly eight stones at the site, perhaps forming a circle. 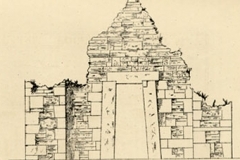 If so, the two northernmost stones may have served as a ceremonial entrance, as they are set with their widths parallel and are 2 m (6.5 ft) apart.10 One of these is broken, with its upper part resting against the sad stump of the pillar. 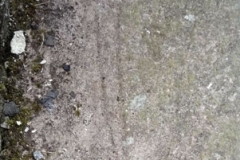 The possible entryway and the broken stone may best be noted in the single-node VR view (below, left) which shows the stones with the swardy field freshly mown. 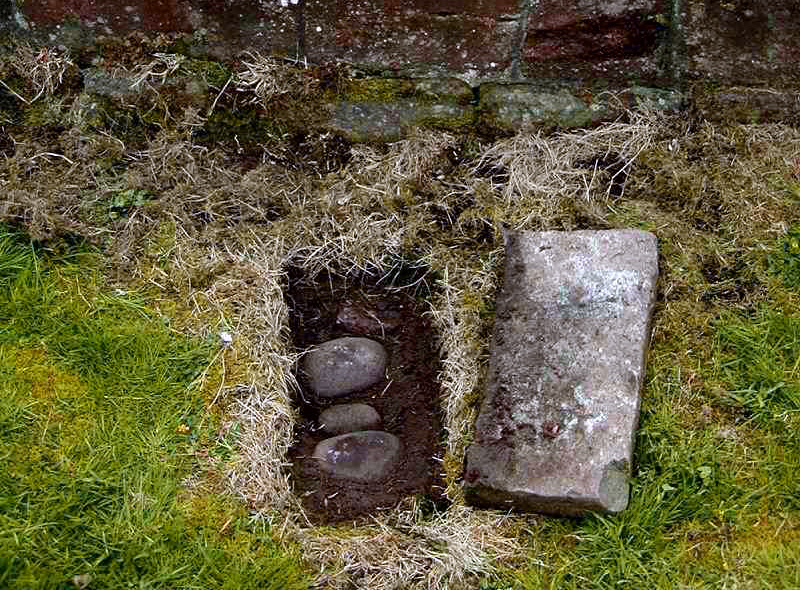 In a local legend, perhaps adapted at some point to suit the broken stone, a plaque at the site says that the standing stones were once four thieves who tried to flee after stealing some treasure from the church on the hill above. Molaga saw them trying to escape and in an instant turned them to stone. The small (broken?) 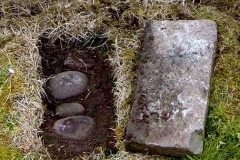 stone is said to be the thief who knelt down to re-pack his booty after some had fallen to the ground. On another visit, the stone alignment was cleared of vegetation. Click to view in virtual reality. 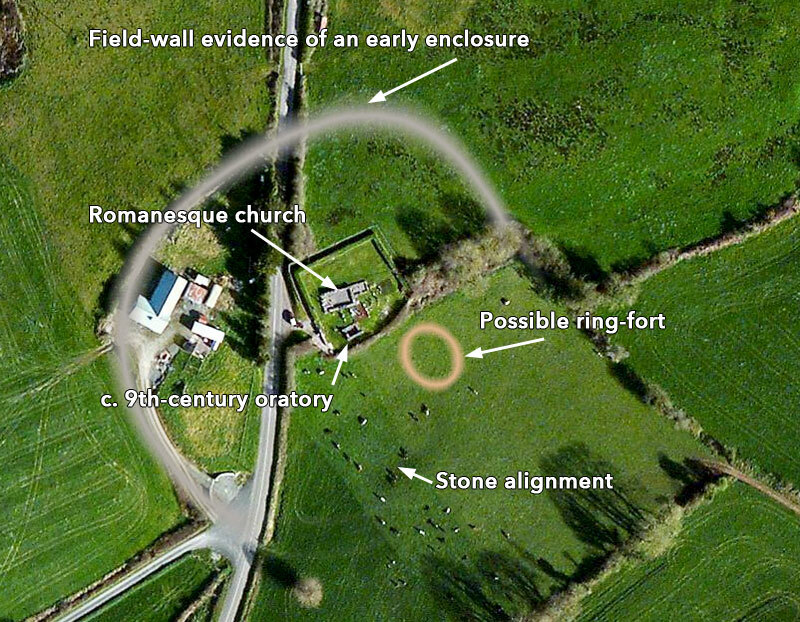 This aerial view (Bing) shows the Labbamolaga monastic enclosure and the stone alignment in the field to the south. Click on the image to see the features delineated. 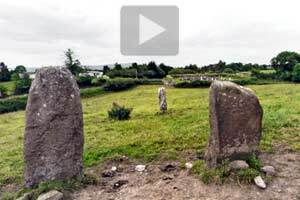 These very spools are today known as the “cursing stones (Clocha Molochta), now secreted under a slab elsewhere in the graveyard (see gallery below). According to a plaque at the site, their magical powers could be invoked by repeating a formulaic curse while rotating the stones counter-clockwise. 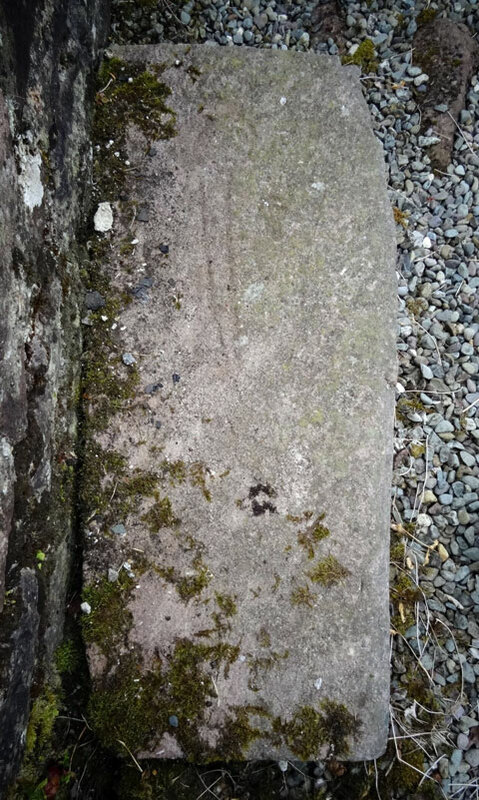 Stones with such reputed powers are found elsewhere Ireland, paradoxically usually associated with churchyards, such as the bullaun with cursing stones at Kilinagh Church, in Co. Cavan. 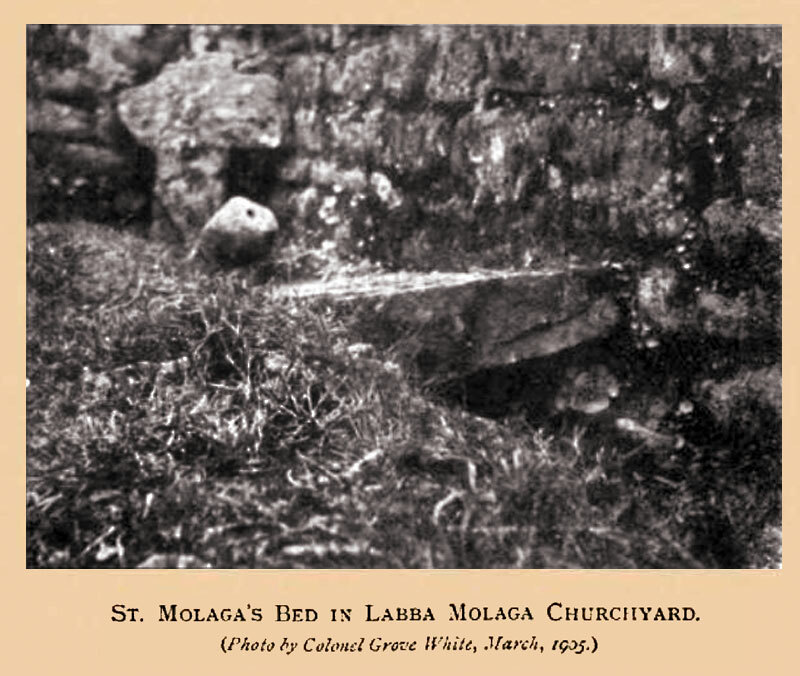 Late in the 19th century a well-meaning detachment of British soldiers, along with masons and workers, appeared at the crumbling Labbamolaga ruins, hoping to endear themselves to the locals by working to clean up the jumbled stones at the site and restore the walls. The people of the neighborhood, however, feared that the soldiers intended instead to destroy the holy site. The military and the masons, faced with angry crowds, were forced to retreat. 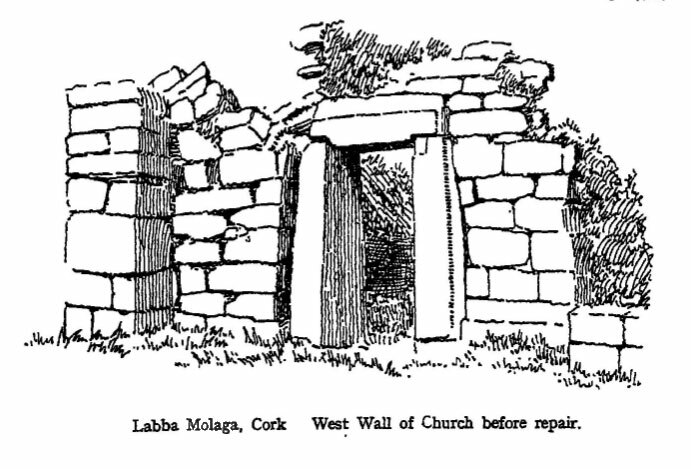 It would be another 80 years before the church ruins were to be stabilized and the walls restored by the Irish Government.22 Is it possible that the Labbamolaga Oratory’s entranceway was at one time repaired using the upright megaliths appropriated from the prehistoric stone alignment? 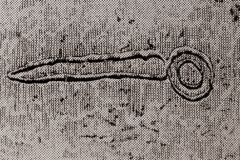 If so, this may have been a classic example of robbing pagan to pay Paul, and would symbolically reflect the cultural shift that created the Christian St. Molaga from the nucleus of the pagan god Lug.